TW Steel has revved up its ‘Big in Oversized Watches’ family with the introduction of the four-strong Yamaha Factory Racing collection. 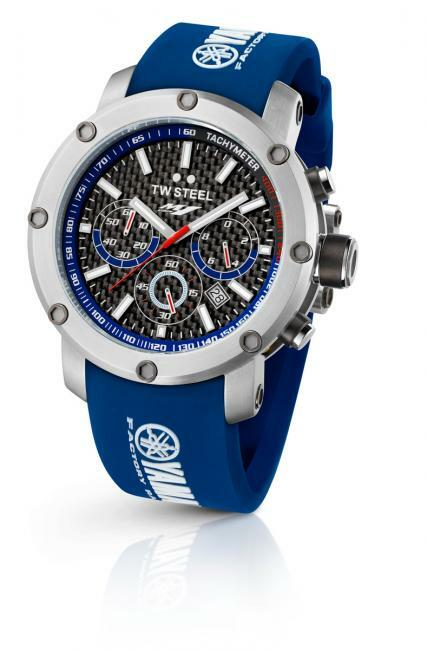 Boasting two Tech and two Pilot executions, these timepieces perfectly showcase TW Steel’s famed design accents while at the same time they infuse the very brand DNA and the racing pedigree of Yamaha Factory Racing and its current YZR-M1 bike into each piece. Having first announced its new role as an ‘Official Sponsor’ of Yamaha Factory Racing – one of the leading factory teams in the MotoGP™ championship, back in May, Saturday’s watch unveiling, hosted at the San Marino MotoGP™ round, heralds the next step in the relationship. It is a move which will undoubtedly appeal to watch lovers and fans of both the team and its riders, reigning World Champion, Spain’s Jorge Lorenzo (#99), and Italian legend and multiple MotoGP™ World Champion, Valentino Rossi (#46). TW924 (45mm) and TW925 (48mm), the two Tech editions, kick start the Yamaha Factory Racing collection with a sporty appearance that includes a steel case with PVD yellow gold plated pillars, shaped to resemble shock absorbers, on the side of the case with a thin red line. The screws mounted on top of the bezel are PVD dark titanium plated, as is the mid piece of the crown and the pushbutton holders. Powered by a Miyota 6S20 movement, a state-of-the art big caliber movement four times more powerful than other chronos, these models feature a race-orientated dial with the chrono eyes based on the dashboard from the team’s race bikes. They sit on a sleek black carbon fiber dial with white indexes along with a striking red second hand. The YZR-M1 logo, the name of Yamaha’s MotoGP™ racing bike, sits below the TW Steel logo while on the case back, the Yamaha Factory Racing logo is engraved for added appeal. With a sapphire layer and a blue silicon strap with a white Yamaha Factory Racing logo double-injected for a more prominent effect, the result being a raised profile for the logo, both of these Tech models are 10ATM water resistant. The Pilot models, TW926 (45mm) and TW927 (48mm) emulate a more luxurious quality to the partnership than the performance driven design of the Tech editions. Also using the Miyota 6S20 movement, the Pilot executions feature a steel case with PVD yellow gold plated pushers and a hardened mineral crystal. The other design effects emulate the Tech editions with the same dial design, red second hand and logo incorporation on the front and back. Completed with a blue silicon strap with a white Yamaha Factory Racing logo double-injected for a more prominent effect, both of these Pilot models are 5ATM water resistant. All models are presented in a stylish co-branded TW Steel / Yamaha Factory Racing box. “I had promised that this collection would represent the very best of both our brands and I’m proud that we’ve delivered on that statement,” stated Jordy Cobelens, CEO and co-owner of TW Steel. “Yamaha’s heritage, success and global outreach were hugely important in considering the design of these models. They represent excellence along with other shared attributes such as passion, performance and attention to detail. TW Steel is a private, family-owned company founded in Amsterdam in 2005 now retailing in over 100 countries and counting worldwide. In addition to its partnership with Yamaha Factory Racing, TW Steel is the ‘Official Timing Partner’ to the Sahara Force India Formula One Team and enjoys a stellar brand ambassador portfolio including Kelly Rowland, David Coulthard, Emerson Fittipaldi, Mick Doohan and Dario Franchitti. 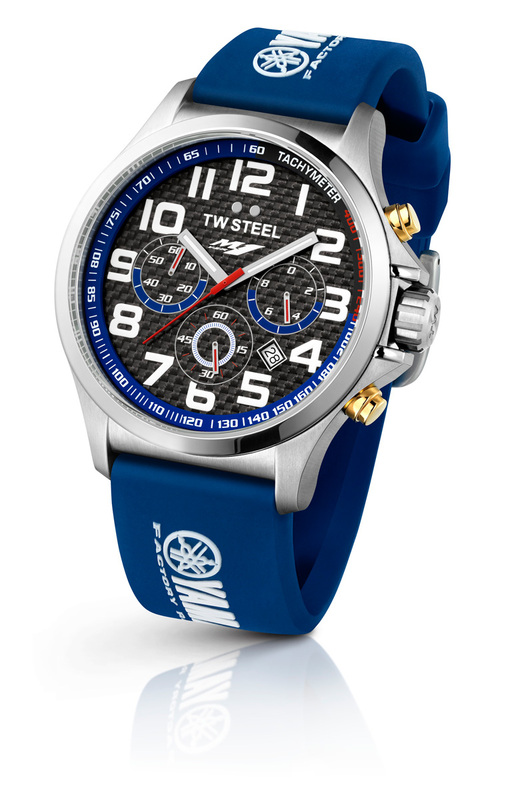 With its name meaning ‘The Watch in Steel’, TW Steel is firmly established as a big, bold, global lifestyle brand. Its timepiece collections are reflective of, and available for all tastes and occasions with innovative design and luxurious styling paired together with Swiss build quality and an exceptional price point. TW Steel offers a defined sense of individuality and shows to the world that as a bold and ambitious personality, you wear a statement watch that truly reflects who you are. Yamaha Factory Racing is Yamaha’s wholly-owned full-Factory Team in MotoGP. The team was founded in 1999 and is now based in Gerno de Lesmo, close to Monza, in a brand new state-of-the-art facility with all technical, logistical, managerial and communications departments housed under one-roof.